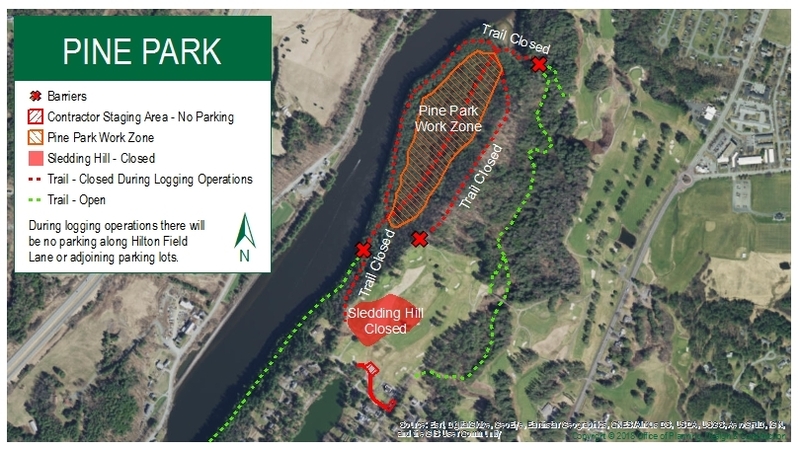 Pine Park is located in Hanover, N.H., just north of the Ledyard Bridge. Pedestrians typically enter the park near the Hanover Country Club via Rope Ferry or Occom Ridge road. Trail heads are located at various points along the perimeter of the 18-hole golf course, including near the third and 18th tees. There is no dedicated parking lot, but drivers can park near the Hanover Country Club and Dartmouth Outing Club. Pine Park is open to the public every day of the year. There are no gates. Pine Park consists of more than 90 acres of conserved woodland. Several trails wind through the park, including along the Connecticut River and Girl Brook. Are there public services in the park? There are no bathrooms or public services in the park. The park has no special facilities for people with disabilities. What forms of recreation are allowed in the park? Walking, running, cross-country skiing, and snow-shoeing. No bicycles or motorized vehicles are permitted. No camping is permitted. Can the public picnic in the park? Yes, as long as picnickers carry out all food waste and debris. There are no trash receptacles in the park. There are no picnic tables or benches. Pine Park, Hanover’s oldest conservation area dating back to 1905, is owned by the Pine Park Association, a nonprofit governed by a board of trustees. The Town of Hanover and Dartmouth College generously help to maintain the land. The association receives no direct funding from the town or college for conservation or maintenance. Whom should I contact if I have other questions about the park? Questions and comments can be emailed to info@PinePark.org.